Luanda is the capital and largest city in Angola with a population of almost 5 million inhabitants and has grown enormously during the last decade or so. Founded in 1575, it is located in the northwest of the country along the coastline of the Atlantic Ocean and functions as the economical, administrative and cultural heart of the country. Strangely enough, this city is the most expensive one for expats to live in. For travellers though the city is more of a starting point to visit the rest of the country than an attraction of its own. Augostinho Neto Mausoleum, ☎ +244 222334835 - Upon arrival in Luanda, it is impossible to miss the towering obelisk-like structure shooting above the rest of the city. If you're curious to know what it is and why it is there, it's a mausoleum dedicated to Augustinho Neto, the first President of Angola who led Angola's struggle for independence. Fortress of São Miguel (Fortaleza de São Miguel), Calçada de S. Miguel - Built in 1576, it became the administrative center of Luanda during the early part of colonial rule and was a self-contained city for the early military garrison and an important holding place for slaves. It contains ornate wall tiles detailing the history of the city along with many relics, such as cannons and the original holding cells for slaves. National Museum of Slavery (Museu Nacional da Escravatura), ☎ +244 222371622 - 9:00am to 6:00pm. Built in the area where the slaves were held prior to being taken off to the Americas. The museum building is the Capa de Casa Grande, which is where they baptized slaves prior to sending them off to the Americas. The museum is worth seeing for the chapel itself and the cannons on the outside. In the center of the chapel is a fascinating stone font, but with no description. There are a few period objects of real interest (such as stocks, a whip, shackles), but the framed prints on the walls are mostly copies from published works, with relatively little accompanying information. On a mid-week visit there was no evidence of any knowledgeable guide, and no one available to turn on the video flatscreen monitor that seems to be part of the exhibit. Still, the high, windswept location is beautiful. National Museum of Natural History, Nossa Senhora da Muxima, ☎ +244 222334055 - A museum filled with thousands of species of animals, including fish, birds, crustaceans, and insects. Many of the displayed animals are endangered, and some are even extinct. The museum does an impeccable job of displaying the large amount of diverse organisms that inhabit and once inhabited this nation. National Museum of Anthropology (Museu Nacional de Antropologia), Av. de Portugal 61, ☎ +244 222337024 - Dedicated to educating people about Angolan history and culture, the National Museum of Anthropology features an impressive array of traditional masks along with art, sculptures, tools, weaponry, jewelry, clothing, and musical instruments. Free. São Pedro da Barra Fortress (Fortaleza de São Pedro da Barra) - A fortress that served a variety of purposes throughout its history. It was constructed in the 17th century to protect the area from invaders. When the slave trade began, it was then used as a keep for the slaves until they were ready to send them away. Throughout Angola's struggle for independence against Portugal from 1961-1975, the fort housed nationalists who were arrested and then forced into labor camps. Igreja Nossa Senhora do Pópulo (Igreja da Sé) - Considered to be the first Anglican Church, it is one of Luanda's most treasured cultural and historical sites. The structure dates back to 1482. Aside from its religious significance, the unique Baroque architecture and the lavish interior attract many visitors. Igreja do Carmo - Built in 1669. Igreja da Nazare - A church built in 1664. It is famous for its beautiful altar made of Italian rose marble. Luanda Island Feast is another cultural showcase. The annual party is held on the second Friday of November to honor the deity of the waters and protector of fishermen known as Kianda in Angola. Luanda has a tropical climate, with high temperatures throughout the year but compared to other cities in the tropics it is surprisingly dry with only the months of March and April seeing some heavier downpours. These months are also the hottest months with temperatures well over 30 °C during the day and rarely below 25 °C at night, so these months are best avoided if you don't like hot and humid weather. The rest of the year is slightly cooler and from May onwards dry for months in a row. This is also caused because of the cold Benguela current which prevents moisture from easily condensing into rain. When this current is weak though, this can mean very heavy rain and occasional flooding occur when this is the cast because it is possible that in a few weeks the total amount of a few years comes down! Quatro de Fevereiro Airport (LAD) receives the bulk of international flights to and from Angola, among which are those with TAAG Angola Airlines (Portuguese only), the national airline of Angola. International destinations from and to Luanda include Accra, Addis Ababa, Bangui, Beijing, Brazzaville, Cabinda, Harare, Johannesburg, Kinshasa, Lisbon, Lubango, Lusaka, N'djamena, Namibe, Ondjiva (Namibia), Paris, Pointe Noire, Rio de Janeiro, Sal, São Tomé, Salvador da Bahia and Windhoek. Several other airlines fly to and from Luanda as well, including British Airways from London, Brussels Airlines from Brussels, Air France from Paris, TAP Portugal from Lisbon and probably KLM from Amsterdam at the end of 2008. Moscow, China and Johannesburg all have good connections as well. TAAG Angola Airlines als serves as the main domestic carrier with connections to and from Luanda with Cabinda, Catumbela, Dundo, Huambo, Luena, Lubango, Malanje, Menongue, Namibe, Ondjiva and Soyo. Rail services in Angola have seen an dramatic improvement over the last few years. Reconstruction and modernization are carried out by Chinese firms, rehabilitating what was once one of the most extensive rail network in Africa during under colonial rule. However, trains are of limited use for the tourist as they mainly serve commuters. An exception is the long distance services from Malanje. Notice that rail services still have a reputation of not being fully safe. All long-distance trains terminate at 1 'Estação Central de Luanda', located on Largo Eng. Pedro Folque, north of the city centre. The main road for tourists will be the coastal highway leading north to the DR Congo and south to Namibia. It is very scenic and in reasonably good repair (but between Sumbe and Lobito very bad). Roads are one of the top priorities in reconstruction efforts, including a handful of six-lane highways leading out of the city. Expect a mix of okay pavement on old highways and a smooth ride on new roads. Macon is appearently the biggest and best organised bus company and goes now to most towns in Angola. You can book online, unfortunately only in Portuguese. Ango-Real is another big bus company. Macon and Ango-Real have their own bus terminals, Macon has more then one, one is next to the Kikolo Market north of the town, one in Golf2 a suburb in the east one south of the airport, ask you accomodation which one is yours. There are also some local services in Luanda and in between cities. The roads in Luanda are generally of okay standard, as is the case on the main routes between cities, but elsewhere road quality greatly decreases. Don't be surprised if you encounter unexpected problems during the rainy season. In Luanda main streets are paved, but streets in the slums are in disrepair, and most roads have no lines or signals. As mentioned before, there are improvements being made throughout the city. 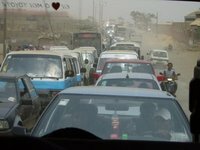 Congestion is a major problem with lack of public transport and the plethora of minibus taxis. The government is investing in an expansive a bus system to attract Luandans to use it. A popular means for locals to get around the city is by mini bus taxis (Candongueiros), easily identifiable by their pale blue and white. Although they are considered dangerous by most expats, locals use them on a daily basis. During the daytime, until around 8PM, they are a safe, convenient, and usually very fast means of transport in the inner-city. Fares are 150 Kwanzas per trip, except in rain or heavy traffic, in which case the fares are doubled. Consider to use the Macon Taxi a private taxi company (20-30 USD per trip). B Home will provide airport pick ups and are available for hire (drivers) +244 222 264 423 B Home has offices in Luanda, Angola and in Houston, Texas. +1-281-444-5988 (Houston Office). Afri-taxi had 150 vehicles in Luanda and a rank at the airport. The majority of restaurants are on The Marginal' or on Ilha De Luanda. Be careful; when eating out, do not drink the tap water. Ilha de Luanda is where Luanda's elite go to dine and have fun. The Belas Shopping mall has a food court with a variety of options from local foods to pizza and burgers. Luanda is highly influenced by Portuguese culture, - Portuguese beer is widely consumed, although Heineken and Carlsberg make an appearance. Super Bock, Sagres, and Cristal (most consumed) are the most consumed beers from Portugal. Besides, you may find a broad range of local beers such as Nocal, Cuca (the most consumed - especially the excellent draught version, or "fino" in Portuguese) and Eka. Surrounding countries also try to find lucrative market, so don't be surprise when in other beer brands are served in local restaurants. Try Portugalia (Portuguese Beer House) at the beginning of the Ilha, or either of the two boat clubs just on the Ilha for a nice sundowner (Clube Nautico and Clube Naval). Don't forget the excellent Portuguese wines also widely available. Hotel Presidente, ☎ +244 222 311 717, e-mail: geral@hotelpresidente.co.ao. A 4 star hotel in the city center. Single $264, double $303. Rouxinol Luxury Guesthouse (4 Stars) (Hotel Rouxinol), Beco de Moçambique nº 16, Bairro Cruzeiro, ☎ +244 923 745 078 (Farah), +244 923 581 308. Check-in: 12:00, check-out: 14:00. Near the Embassies in Miramar and the centre of town. $180-400. Inn Luanda (Inn Luanda Boutique Hotel Type), Rua Francisco Sá de Miranda, nº 50, ☎ +244 922687350, +351 919863637. Boutique hotel located in residential area close to center. Very clean and good air-con with free WiFi. Breakfast was included and they can prepare lunch and dinner. The manager speaks English. Single $225, Double $245, Triple $275. Jobs are mainly available in the oil sector, but also in the increasing number of international Angola based companies which are investing in Angola now that peace and stability are offering great development prospects for the country. The country calling code to Angola is 244. To make an international call from Angola, the code is 00. Telephone connections, cellular and landline, are heavily overloaded, making communication difficult at times. International lines are, however, often better. This is version 13. Last edited at 9:31 on Apr 8, 19 by Utrecht. 12 articles link to this page.